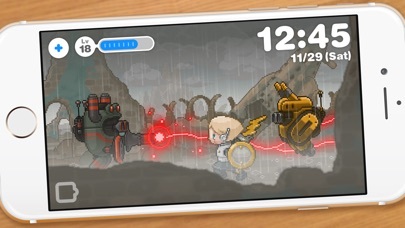 Discussion in 'iPhone and iPad Games' started by PeteOzzy, Jan 21, 2015.
dreeps is an award-winning Japanese indie game that received both the "Best of Art" and "Best of Game Design" at Indie Stream FES 2015! 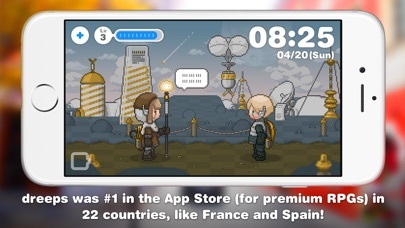 It also was #1 in the App Store (for premium RPGs) in 22 countries, like France and Spain! dreeps has been updated! Released in 2015, this unique pixel-based Alarm Clock Game with the killer chiptune soundtrack was released to wide acclaim. Now, we've brushed up the graphics and sounds, and even added a few new things. Hope you like the changes, and thanks for playing dreeps! — introduction — For those who don’t have the time to play RPGs anymore, this is a new type of game—an Alarm Playing Game! 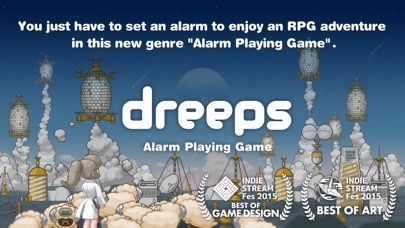 To play dreeps, just set the alarm. That’s all. Easy, right? When you head to bed, the robot boy will sleep just like you, regaining HP and recharging for his next day of adventure! When the alarm rings in the morning, both of you will wake up and start your day. When you go to work or school, the robot boy will head out on an adventure through fields, valleys, and peninsulas where monsters roam. Or, he might discover dungeons where strange bosses lurk... Either way, every day is a new day for you and the robot boy! But how does adventuring work? That's real easy! After the alarm sounds, the robot boy's adventure will automatically continue as long as he has enough HP, even while the app is closed. You might miss some events, but don’t worry about it. There’s almost no text in this game. So whenever you feel like it, load dreeps up and check on the robot boy's adventure. Or, leave it running on your desk while you work, study, or snack. Play however you want, and take it at your own pace. Visuals and sound can give you hints to what sort of story is unfolding in this little world. But use your imagination! Take those hints and try to guess just what's happening. Oh! And don't forget that you can share screenshots of and thoughts about the game by pressing the "Share" button. 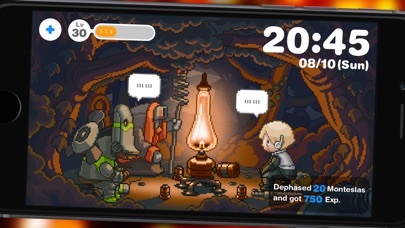 dreeps was created to give the player the ability to enjoy a story little by little, day by day. With beautifully crafted art and animations, this is a new kind of game that's easy to pick up and simple for anyone to learn. This pocket-size adventure has been made for you by three people in Tokyo who put all their hearts into delivering a fresh and charming experience. Thank you for playing dreeps! I really love the sound of this; I'm hoping it will almost be Godville with pictures which would be great. Shame it's not Universal but it's not really the kind of game that demands it at least. Very tempted! Second: Wait - is something playing a game for me while I'm at work somehow fun for me or something? Third: So a game being played for me while I'm at work is cool, but while sleeping is morally wrong? Sure, I totally get it. This was a game showcased at the Indiefest at last years Tokyo Game Show. It got a lot of interest and the developers sounded really passionate about their work. I'm definitely going to give it a try! Godville X Sleep Cycle Alarm Clock? This looks gorgeous! I loove the art. I am skeptical just because it seems like the art would take a long time to create for a big game. I guess I want to know how massive this RPG really is. The file size on the app right now seems quite small. I'm a bit biased but I feel like Japanese devs know their RPGs so I'll give them the benefit of the doubt. I do want to hear some mini impressions at least but I'll probably end up buying it tomorrow. I also want to know if this requires you to constantly be online to play it (like Godville). I would bite if this were Universal. Artwork reminds me some Hayao Miyazaki animes. Characters seems nice enough. But you do nothing while the boy goes adventuring? This only may limit the scene and artwork number by itself, because you do not have to actually see what is happening. Otherwise, looks like it is worth playing. This game looks interesting I was having a tough time trying to read and understand the description of the game. The game plays for you? Kinda like watching TV I guess. Personally, I need to be actively involved for there to be any kind of interest. I've seen games where there's little to no input and it's hard to stay captivated for a longer period of time, especially when you're spending $2.99 on it. I'm curious though.. might invest and see what it's all about. Haha. I invest $5 a month to watch other guys play mobile games on Twitch while I'm at work. Seems like it could be fun to watch. But I'd have to plug my phone in, that's for sure! The graphics and animations look absolutely stunning! Have to try how much interactivity the game has! Reminds me of this old Yoda app I had on my first flip phone. He would do stuff and I could look in on him, but I never actually played the app. Seems like no one is interested enough to buy the game. Not even a single gamely video. I don't have the ability to upload a video at the moment, but I can tell you what I think so far. It looks like a retro side-scrolling game. You set an alarm. And your character will run out of stamina so you put him to sleep when you go to sleep. When the alarm goes off, you open the app and your character wakes up too. He then goes off on an adventure. Pretty sure he'll traverse the same areas every day, depending on the time. There's a map that shows where he's at in relation to the entire path. When you open it up throughout the day you can watch him walk, eventually battle a few enemies, and enjoy the pretty backgrounds and sounds. Personally, I'd like to see the ability to switch alarm sounds, to customize the main character's look and weapons, and maybe even play a mini-game throughout the day to boost his energy. But, it's a neat app for those who enjoy RPGs, but don't have the time to sit and grind through the traditional turn-based JRPG. Your character has experience and levels up. Not sure if this will change battles, help him take on new/harder enemies. I've only opened it a few times since purchasing it this morning, but each time has greeted me with a leveling up notification and gorgeous visuals. My verdict: Worth more than a $3 latte. Curiosity got the best of me too. I agree with Curtis on all the points he made. I did notice when my robot boy took some damage after a battle he was just standing there panting and I tapped him and he seemed to regain health. Not sure if it was just coincidental timing or if I actually did something though! He went down again and tapping him did restore his health! Nice! Great deduction. I guess I needed to keep it open longer to try this out. Also, it's a little weird that the foreground objects have a less than 100% opacity, meaning you can kind of see through them, slightly. Wonder if they meant for it to be like that.